This allows us to book your design time in our schedule and to get some ideas rolling. 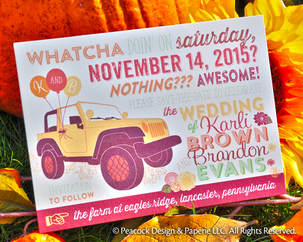 Karli & Brandon wanted trendy fonts and lots of Autumn color for their November wedding to come. After their consult, Karli sent us pictures of Brandon's Jeep and asked if we could tie it into their save-the-date because his bright, yellow Jeep "defined him." Wedding Save-the-Dates are mailed from 6 months to 1 year before the event date so that guests can mark their calendars or plan for destination weddings. Book your design time in our schedule as early as possible (no one likes to rush, including us!) for a consultation. For those procrastinators (and we know you're out there), you should expect between 3-5 weeks of design & production time before dropping save-the-dates at the post office. Wedding Consultations should be booked with us at least 7-12 months before your wedding. We'll send initial designs to you about 4-5 months before your wedding, and the production phase begins about 1 month after that. You should mail your invites out to guests 8 weeks before the wedding (but no less than 6 weeks). If you have only 4 months left before your wedding, you may contact us and we'll do our best to fit you in, if our schedule allows it. Birthday party, baby shower, corporate event (etc.) invitations are usually sent out 3-6 weeks in advance of the event date (depending if you need a formal RSVP for a caterer). You should book your couture design project in our schedule as soon as possible, with a minimum of 4 weeks prior to your mailing date. Keep in mind, we already have projects in our schedule, so although you may think that it can be designed and printed in a few days, we must still fit into our schedule: your estimate, design time, shipping time for special order materials, etc. So please plan on a few weeks from your consultation to your finished products. 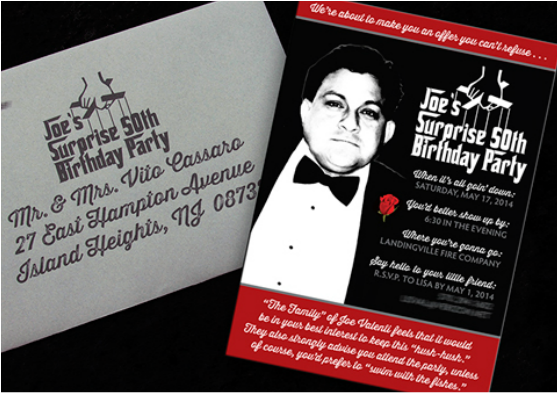 An invitation to a Godfather-Themed Adult Birthday party was an offer guests couldn't refuse. PLEASE NOTE: Our reply emails often get sent to spam/junk (due to a certain part of our company name that gets flagged as spam), so please add our address to your contact list: info@peacockpaperie.com or email us directly. If you do not see our reply within 24 hrs, please look in your spam folder. We never ignore anyone! We answer calls M-F from 9:30-5:30. If you receive a voicemail, we are in a consultation or stepped out of the studio and will call you back if you leave a message. Flexible days & hours (including weekends) are available. By appointment only.